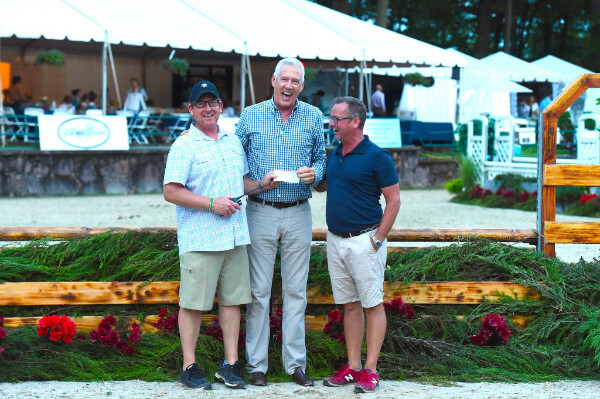 Wellington, Fla. -- Aug. 16, 2018 -- Equestrian Aid Foundation was honored Tuesday evening at Monmouth at the Team in Gladstone, N.J, where show co-owners Tucker Ericson and Michael Dowling presented a check to foundation board member Scot Evans. The donation marks competition management's second year of support for the Equestrian Aid Foundation's Horse Show Partners program. "The Equestrian Aid Foundation has been at the center of our community's well-being for over two decades," said Ericson. "It's an honor to support their mission and welcome them back to Monmouth at the Team." The Centenary University Intercollegiate Horse Shows Association team, represented by coaches Michael Dowling and Heather Clark, also presented a check to Evans Tuesday evening on behalf of the team’s fundraising project with Longines Masters New York. Originally named the Monmouth County Horse Show, this much-loved competition holds the record as the longest continuously-run horse show in the United States. In 2016, under the ownership of Ericson and Dowling, it was renamed Monmouth at the Team and moved to the USET headquarters at the iconic Hamilton Farm. The week-long competition offers outstanding awards and prize money and unparalleled hospitality. Show managers who are interested in participating in the Equestrian Aid Foundation's Horse Show Partner program are encouraged to click here to learn more or contact Emily Cleland at Emily@EquestrianAid.org.